From 2014 to 2016, a pilot study was developed in the Kayes Region, Kita district, at 9 health facilities with 18 Community Health Workers (CHWs). 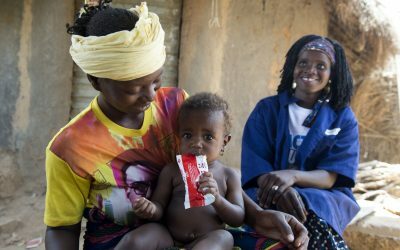 Impact: The use of Community Health Workers to diagnose and treat severe acute malnutrition outside of the health facilities has the potential to become a global approach that could be tested and delivered in other countries and contexts. With this aim, Action Against Hunger is actively working to contribute to the global evidence base with three additional pilot studies testing this approach. Find a summary of the evidence in Mali as well as in Pakistan here. Quality of care for treatment (J. L. Alvarez Morán et al., 2017) The majority of SAM-affected children were correctly assessed for the presence of major clinical signs as well as of danger signs. Effectiveness of treatment (J. L. Alvarez Morán et al., 2018) CHWs treated and rehabilitated the large majority of children enrolled in the programme. They reduced the risk of children abandoning treatment before completing it. Cost-effectiveness of treatment (E. Rogers et al., 2018) The delivery of treatment by CHWs is a cost-effective intervention, a major benefit of this strategy was the lower cost incurred by the beneficiary household when treatment is available in the community. Impact: The use of Lady Health Workers to diagnose and treat severe acute malnutrition outside of the health facilities has the potential to become a global approach that could be tested and delivered in other countries and contexts. Rogers et al. 2017. Quality of care of treatment for uncomplicated severe acute malnutrition provided by lady health workers in Pakistan. From November 2017 until May 2019, a pilot study is ongoing in Maradi Region, Mayahi district, at 12 health facilities with 12 CHWs. Is SAM treatment delivered through CHWs as effective (cure, death and defaulters rates) as SAM treatment delivered at health facilities? Will access and coverage in the communities where CHWs deliver SAM treatment increase after 12 months? Do cases treated by CHWs show fewer complications? Is there a correlation between MUAC admission or weight-for-height (PT) admission and length of stay? What is the correlation between MUAC and the weight-to-height index for identifying a child with MAS? From November 2017 until May 2019, a pilot study is running in Guidimakha region, district of Selibaby at 8 health facilities with 12 CHWs. Are CHWs capable of providing quality SAM case management? Partners: Direction de Sante de Base et Nutrition (DSBN) in Mauritanie, UNICEF, Institut National de Recherche en Santé (INRSP), la faculté des sciences et techniques de l’université de Nouakchott.